Creative Twist On A Gin & Tonic – G’nT(ea)! One of the many reasons we love tea so much is it’s versatility. There are so many variations, flavours and uses that there is literally a tea or herbal tisane for every mood and every occasion. Enter Heebs. Who else would have thought to combine Jasmine Buddhas Tears into a cocktail? Or our Apple Cinnamon herbal blend for that matter. Most recently, our Berry Delicious fruit blend featured in a delicious Gin ‘n Tonic recipe on One Drink A Day’s blog and it worked a treat! You all know how much we love tea. We’ve baked using tea, made scones, smoothies and chia pudding using Japanese Matcha Green Tea, we’ve even experimented with slow cooked Silverside using our herbal ayurvedic blend, Tulsi Detox. As creative as we’ve tried to be with our tea love, one thing we had never even considered making was….. TEA COCKTAILS! Why had we not thought of this?? We’ve been very excited to have Teatini use our Green Paradise green tea blend to create yet another cocktail to get the taste buds tingling. 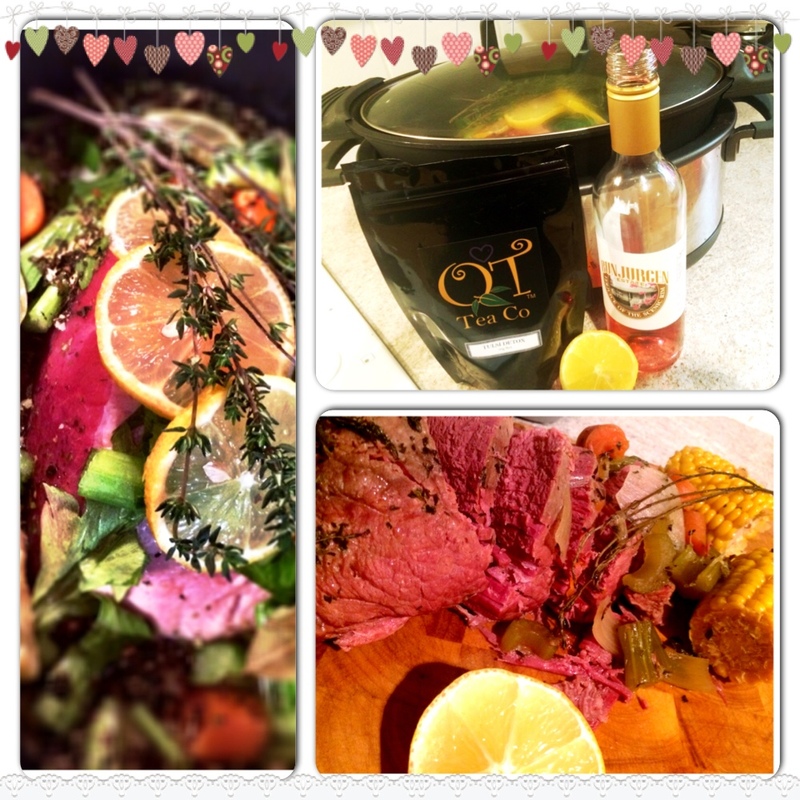 Here’s the recipe courtesy of the girls, why not give it a try?! The stunning Green Paradise Green Tea Blend blend by QTea Co is such a delicious green blend! This drop will definitely have you daydreaming of getaways to your very own island paradise. With ingredients of green tea, marigold petals, safflowers, jasmine flowers, hibiscus, with lychee and mango flavours, it is the perfect summer cooler in a vodka fizz style cocktail. Stir tea-infused vodka with Elderflower Liqueur and lemon juice in a highball glass with ice, top with soda water. According to Webster’s Dictionary, scones are said to have originated in Scotland in the 1500’s. In fact the Oxford English Dictionary suggests that the word originally came into use in 1513. There are two differing pronunciations for the word – “scon” (rhymes with “gone) and “scone” (ryhmes with “phone”). In British English the two variations are used according to both regional and class associations, but in general terms, the first version is associated with the northern parts of England, Canada, Australia and New Zealand. The second version is associated with southern parts of England, America (US English) and Irish natives. Scones are a standard addition to the traditional Devonshire Tea and are generally served with jam and cream. A little sweetener is sometimes added and this can also be in the form of currants, sultanas, raisins or dates. Scones can also be served as a savoury treat, with either cheese or potato added. For our scones, we decided to shake it up a little and take a less traditional approach by adding some QTea Matcha Green Tea Powder. The irony is that Matcha is absolutely packed with health benefits and is known as a superfood, but we chose to serve our scones with more than modest lashings of strawberry jam and cream.. Oh well.. we did also add some fresh strawberries for additional goodness..! What a great review of QT Tea Co by Living in the Shires’ Susan Prior, editor, content producer & writer! It’s a great read! I was a bit excited to find a tea importer right here in our midst, in the Shires. I jotted QT Tea Co.’s details down on my ever-expanding places-to-go, people-to-visit list of things to cover in Living in The Shires. 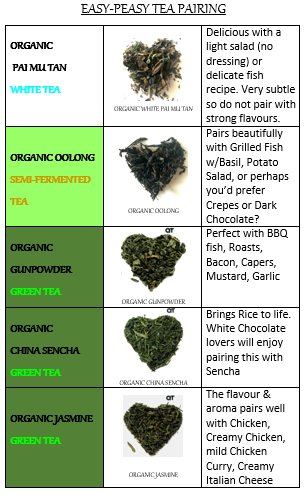 HAVE YOU HEARD OF TEA PAIRING? A growing number of restaurants around the world now not only have a Sommelier (Wine Waiter) but also a Tea Pairing Waiter, with a full selection of tea on their menu to accompany any meal. More and more restaurants/chefs are recognising the benefits of pairing tea with food. We’ve prepared the infographics above to show how easy it can be, by pairing some of our delicious tea with various food suggestions to help inspire your creativity in the kitchen – the possiblities are endless..!